Ion exchange (IX) is one of the most cost-effective and reliable water quality improvement technologies in the marketplace today, proving itself year after year as the gold standard for cost, performance and dependability. Ion exchange technology can be used in residential, commercial and industrial processing applications to soften, condition and even purify potable and greywater waters. As with many advanced technologies, ion exchange is often easy to deploy at the entry level, even though there is much more to it than most dealers realize. Entry-level applications include traditional salt-based softening and nitrate removal applications, but there is so much more that you can do and there are great strides in operational efficiency and effectiveness to be achieved if you’re willing to make the time and effort to learn more about the technology. The key to understanding ion exchange is to emphasize the actual exchange process, where one ion is exchanged for another with the resulting byproduct(s) of exchange remaining in the treated water stream. This exchange is the key to understanding how IX can be incorporated into your portfolio. In the February 2013 issue of WC&P, we introduced you to the basics of ion exchange, so I will not bore you by repeating it. We will also not discuss demineralization in this article, since that requires an article of its own. Instead, we’ll dive right into expanding the repertoire with some more esoteric applications. Aqueous metallic ions are positively charged (cations); non-metallic ions are usually negatively charged (anions). Selection of resin for treatment, as well as the operating performance of that resin, depends on the concentration of contaminants in the water, including the resin’s relative affinity for the contaminants and their interfering factors. Strong acid cation (SAC) resin is generally recognized as the most popular resin in use today. 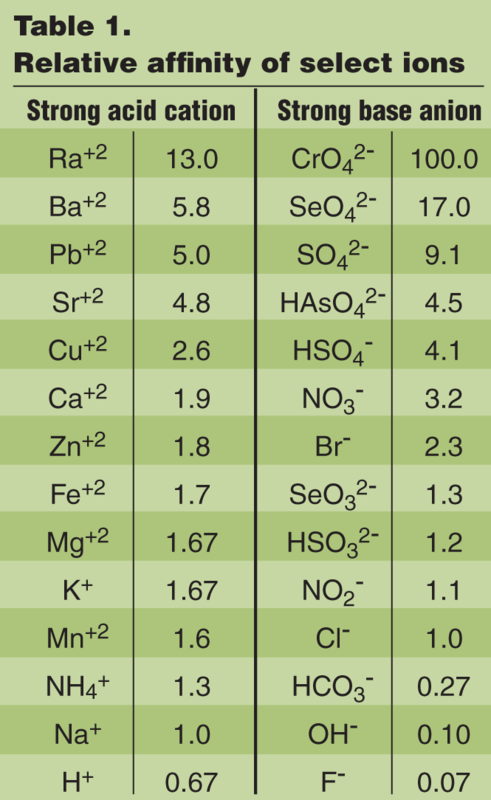 As you can see in Table 1, a typical SAC resin is highly attracted to heavy metals and less so to the regenerant ions (sodium and hydrogen), which is why we can deploy SAC so effectively in highly sodic waters and still be able to remove calcium (albeit with some ionic leakage). The resin’s affinity varies with the ionic size and charge of the aqueous ion, generally favoring large, highly charged ions. Refer to Figure 1 for a representation of the functional group in this type of resin. During regeneration, a less attractive ion, such as sodium or hydrogen, is used to regenerate the resin and the only way it can force the entrained ions off of the resin’s functional groups is in a highly concentrated form. This phenomenon is referred to as mass action. From a design perspective, we need to consider mass action carefully when calculating brine/rinse rates on high hardness waters and deciding on the injection system design, since drawing the brine solution through the resin bed too slowly can actually result in reversal of the regeneration reaction and cause contaminants to be driven back into the resin media. I see this quite frequently where dealers try to use undersized equipment on water with high hardness, high TDS or where there are significant amounts of other interfering metallic ions in the water. When working on wastewater applications, SAC resin is used to great effect in removing regulated contaminants like copper and zinc, but if the dealer doesn’t understand the overall holistics of the application, their efforts might be stymied by something as simple as the inclusion of water softener regenerant waste in the discharge stream to be treated. By including the highly concentrated solution of calcium ions in the stream, it makes the resin’s task of removing the copper and zinc significantly more difficult, and sometimes absolutely impossible. Always remember to fully understand your process before diving in and recommending solutions. Referring back to Table 1, we see the relative affinity of strong base anion (SBA) resin, which is the second most popular resin used by dealers in the US. Refer to Figure 2 for the functional group contained in this type of resin. 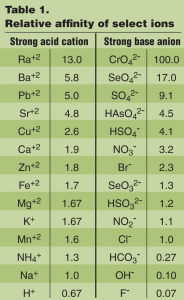 Many dealers have used SBA resin to address sulfates, nitrates and silicates in water, but all too often I see that the rationale for use and an understanding of complicating factors in the water are often grossly misunderstood. Unless specifically engineered to be selective for one anion over others, SBA resins are attracted to all of the -ates in descending order by their molecular size and valence charge. The most frequent faux pas that I see is using SBA for nitrate removal in sulfate-bearing waters and having the sulfate concentration overwhelm the nitrate-laden resin as it becomes exhausted, thus causing dumping of nitrates back into the water. It is crucially important to always test for sulfates and silicates when attempting to address nitrates in water. This will enable you to calculate the true capacity of the resin during service, instead of merely its capacity for the one thing that you’re wanting to treat. SBA can also be used as an excellent organic scavenger for wastewater or industrial process applications. Modern purpose-built macroporous SBA resins are highly effective at removing tannins from water. I encourage dealers to use tannin-selective resins when dealing with colored water issues involving natural organic materials, such as fulvic or humic acid compounds. Remember again that even though you’re addressing tannins, SBA IX resin is attracted to other contaminants in the water, which means testing for them as well to ensure the system will work as expected. Type 2 SBA resin is less selective for general anions and employed primarily in dealkalization applications while operating in the chloride form. Many low-pressure boilers worldwide are being effectively protected by the combination of a sodium softener and chloride dealkalizer. A properly designed anion dealkalizer will typically remove 90 to 95 percent of the carbonate (CO32-) and bicarbonate (HCO3-) alkalinity, as well as 99 percent of the sulfates (SO42-) and nitrates (NO3-). A dealkalizer will yield substantially higher capacity when regenerated with both salt and caustic soda. Refer to Figure 3 to see its typical functional group. Weak acid cation (WAC) resin has a high selectivity for divalent cations, such as copper and nickel (especially at neutral to alkaline pH levels), so it is naturally an excellent choice in wastewater applications as a cost-efficient alternative to chelating resins. WAC resins have the highest capacity of any IX material in the general marketplace at the time of this writing, which makes it ideal for deployment in conjunction with an SAC resin to maximize performance and cost-efficiency. This high capacity naturally means that it both shrinks and swells significantly under various conditions of operation, so exercise appropriate caution if you decide to mix SAC and WAC in the same tank. Refer to Figure 4 to see the functional group for this type of resin. A lot of dealers try to value engineer by deploying anion IX equipment as the sole treatment technology. This is rarely an appropriate choice and will inevitably result in other issues later that cost the dealer customer satisfaction and call-back costs. The ideal situation is to always soften upstream of anion media to minimize complications during service and regeneration. Mixing anion and cation resin in the same tank can be a subject of much emotion and controversy to some dealers, since it is used as a selling point by some. My personal rule is that I will only mix media if the influent hardness level is below 8 gpg (137 mg/L), since the risk of fouling with calcium carbonate and calcium sulfate compounds becomes too high. Also remember that anion resin is much less dense than cation resin and a top distributor screen should always be used to prevent resin loss during backwash. There’s a big world of ion exchange applications out there, just waiting for you to explore. Talk to your OEM or dealer network to learn more about how ion exchange technology can enrich your dealership and provide valuable solutions to your client base. Image credit: Images courtesy of C.F. ‘Chubb’ Michaud and the Innovative Water Project. Greg Reyneke is Managing Partner at Red Fox Advisors, a multidisciplinary research, development and consulting company with a strong emphasis on water, air, microbiology and energy projects. He also serves as an advisor to the ProFlow Dealer Network, a Pentair Platinum Partner and is a member of the WC&P Technical Review Committee.